If there's something I think we should adopt from America, it's turtle candy, or basically anything with caramel, chocolate and pecans. 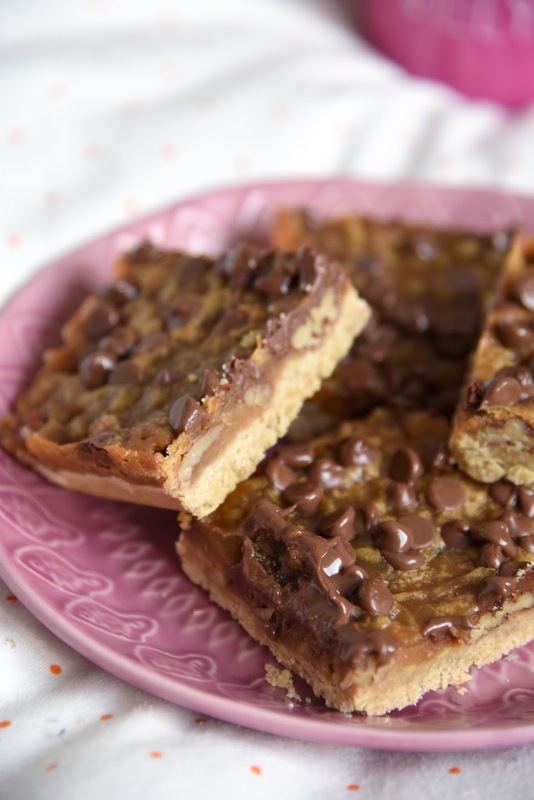 You can make the traditional turtle combo into pretty much anything, bars, cookies, brownies, pies, you name it! 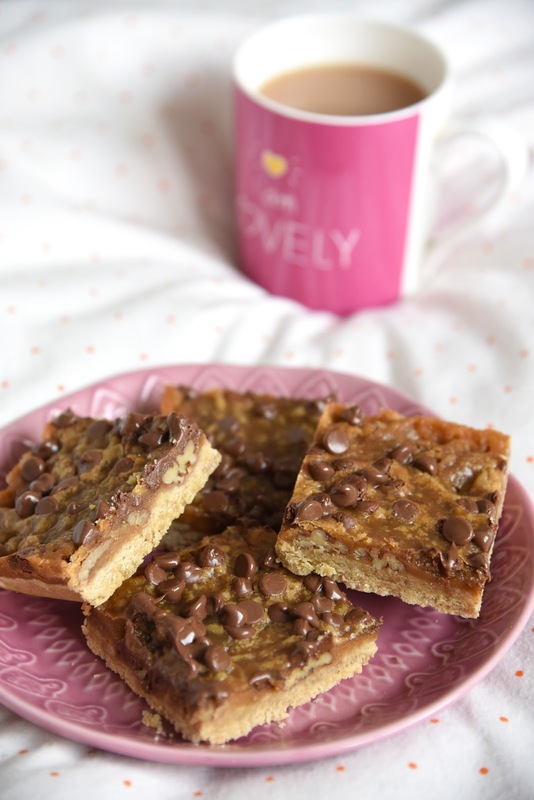 For this recipe I decided to go down the bars route, I'm a little obsessed with traybakes at the moment! 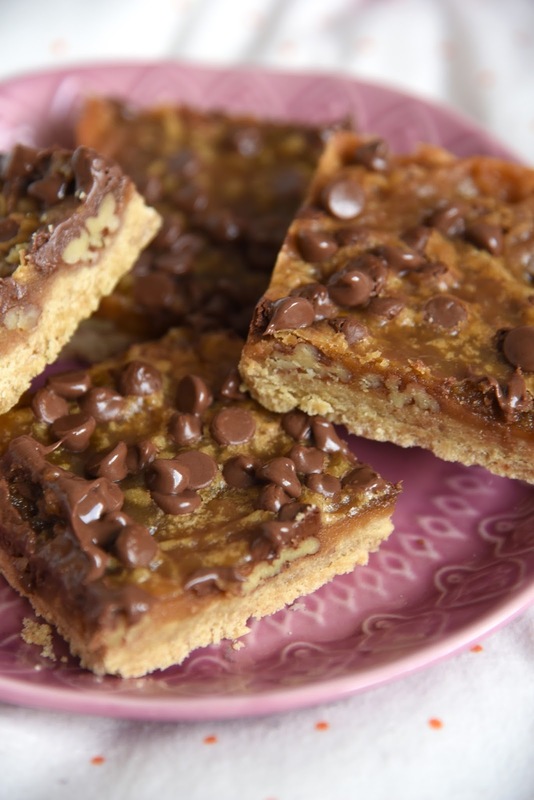 These bars are pretty much just made up of layers and are super easy to make, a crumbly biscuit base, pecans, toffee and chocolate chips! I often wonder how much cheaper pecans are in America, they're so expensive here it's ridiculous! Compared to all the other nuts, I wonder why? Anyway enough complaining about the price of nuts, keep scrolling to get to my recipe! 1. Preheat the oven to 175 degrees C, Gas Mark 4. Grease and line a 8" baking tin. 2. In a large bowl, mix all the base ingredients together until the texture resembles fine crumbs. Press this mixture firmly into the prepared tin and sprinkle over pecans. 3. In a sauce pan, combine the 200g and 100g of light brown sugar, stir on a medium heat continuously until boiling, boil for 1 minute then pour over the pecans. Sprinkle half of the chocolate chips over the toffee mixture. Bake in the oven for 20 minutes. 4. Remove from the oven and sprinkle over remaining chocolate chips, leave in the tin until fully cool then cut into squares.